In a previous life I had the chance of starting from scratch the company’s Software Product Management department. I was able to define the processes and choose the tools to manage them. Although there are great pieces of software out there than can be extremely helpful, it is also certain that they come with a cost. I would like to share here three of these self-made tools. I do not mean to be exhaustive and cover the whole product lifecycle, but to illustrate that you can do great things with as little resources as a spreadsheet. In order to balance the different product development initiatives and help top management decide which ones to pursue, I adapted the Risk Matrix of George Day (originally published in the Harvard Business Review). In this matrix, market uncertainty is assessed in the horizontal axis, while product and technology risks are measured in the vertical axis. The initiatives to be evaluated are charted and fall into empirical risk regions that evaluate the chances of failure. In this case the portfolio is quite balanced with a low-risk Product 1, two incremental developments (Products 2 & 5), a risky Product 4 and a highly innovative Product 3. In a single chart the characterization of each product in the portfolio can be assessed, as well as the risks that demand management attention. This tool allows seeing where in the lifecycle stage a given product is, if and when to expect a new release, and the product versioning policy. There are vertical swimlanes for each stage of the product lifecyle (in my case these were Proposal, Definition, Development, and Launch, but they could be adapted to any other set of stages, for instance to include Retirement). Each version of the product is then located in its corresponding swimlane, and even moved inside it to reflect stage maturity. 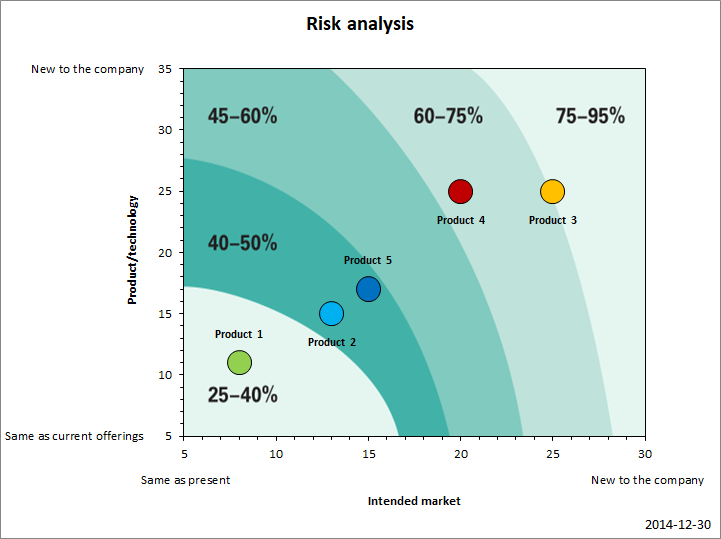 From the previous chart a synthetic risk measure can be calculated and is used to locate the products in the vertical axis. In the example, Product 2 is in active development, a new version of Product 1 has been recently launched and the following one is being defined, Product 3 is about to begin the development of a pilot as the phase 1 is nearing maturity, and Products 4 & 5 are awaiting definition – or a sponsor. 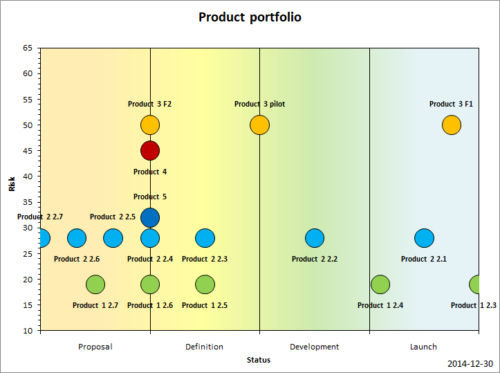 The final tool is a simple Gantt diagram to show product releases over time. Alongside with a feature list by release, it is a powerful way to define product portfolio roadmaps. Here we can see that Product 2 has a faster release cycle than Product 1. Also, development for Products 3 & 4 is frozen, probably because they are waiting for a sponsor. I hope these three tools are useful for a starting Product Manager. Very simple resources and a little bit of creativity can go a long way to support your Product Management process, and you just have to apply them consistently to help you succeed. I first knew about this principle in a guide to data science job interviewing. Later on I read about its many interpretations in the mother of all wikis. The meaning for me is as follows. Firstly write the skeleton of the algorithm, program or thing you are trying to build. Just the basics, with no real functionality, just to ensure that it compiles, runs or executes. Then write the logic in a simple, naive way, but that yields the correct answer. Finally try to improve on speed, space or any other critical performance parameter. Apart from being in line with the avoidance of premature optimization, this way of operating helps in reducing uncertainty, building confidence, and showing early results. Recently I read an ebook titled Creating a Data-Driven Enterprise with DataOps, and this principle appeared in a chapter about Cloud Architecture. Although initially it seemed counterintuitive, the more thought I poured into the concept the more sense it made. In the cloud, storage and processing are decoupled, and the former is cheap and permanent while the latter is ephemeral and expensive. Compare this to on-premise analytics where both are coupled, permanent and limited. The impact that this principle has had on me has been profound, even considering how recently I have discovered it, and it has helped me design, implement, and communicate analytical architectures in a convincing manner. I have recently discovered the deeply rooted misconception that being agile means giving up on preparation and alignment of stakeholders, and just hoping that every problem will sort out itself during the process of development. This is utterly wrong. The Agile Manifesto does not mention fast development a single time. Moreover, there are other references that explicitly state that agile does not equate to fast. In my experience, an agile framework introduces routines and discussion environments where new requirements and feedback from users can be introduced in the scope of the project or product, faults can be detected earlier, and a valid outcome is ready at the end of a sprint. This, however, comes with an associated cost in time and coordination. Agile methods will make reacting to changes easier, but they will not replace preparation before starting a project, and they are not, by any means, an excuse to cherry-picking features to boost in the middle of a sprint for the sake of showing them off in a committee. In the long run, being agile will mean being faster. This will be caused by hitting the mark more frequently, not by making individual projects faster. As a matter of fact, less projects are expected to be run with a higher level of resources. At the individual project level this is clearly slower and more expensive, but at the project portfolio or the product levels it completely makes sense, if the required time for the methodology to provide results is allowed. These three insights have become guiding principles in my endeavors in software development, and they help me make decisions and structure my work. I am always open to improve and learn from others, so… what are your guiding principles? This last weekend I bought a Samsung CLP-300 colour laser printer. It is amazing how cheap these printers have become. It cost the same than my old black and white laser printer. I could have bought a b/w one for the prize of an inkjet printer! The install process has been a problem… in no way the printer was recognized by the OS (Linux or Windows). At the end the problem was… the USB cable! It was not included in the printer package, so I bought a separate 5 meter 2.0 USB cable. It turned out to be faulty. From today version 0.4 of publictransports.info is available! Several bug fixes are included, but the most important thing is that there is more content. I hope you like to use it.